Play your audio files easily on your Apple Devices such as iPod, iPhone etc. You can select iPod Format from Apple Device profile to convert your selected files and play them on different range of iPod devices (Classic, Touch, Nano etc). Once the files are converted, they are automatically added to Apple iTunes (version 6.0 or higher) if it is installed on your PC. iTunes is a digital media player application used for playing and organizing digital music files. It acts as an interface to manage media on Apple iPod, iPhone, and iPad. 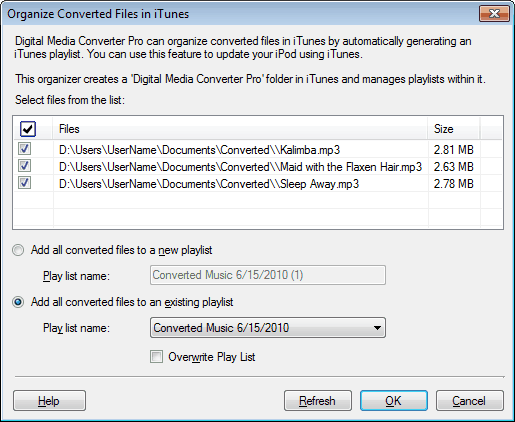 Connect your iPod to your computer so that iTunes can update it with the converted files. 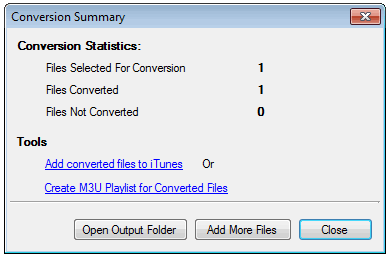 To organize files in iTunes, click the link Add converted music to iTunes displayed on conversion summary dialog. You can create a new playlist or add the files to the existing playlist. You don't have to create a new playlist every time you add some new media files. Enable the option Overwrite Play List so that the existing playlist is replaced with the new one. Click Refresh to update the Organizer with the changes made in the iTunes.